Why Is It so Hard to Save the Biosphere? Piggy Bank by Ken Teegardin. Rain Forest by Kahunapule. 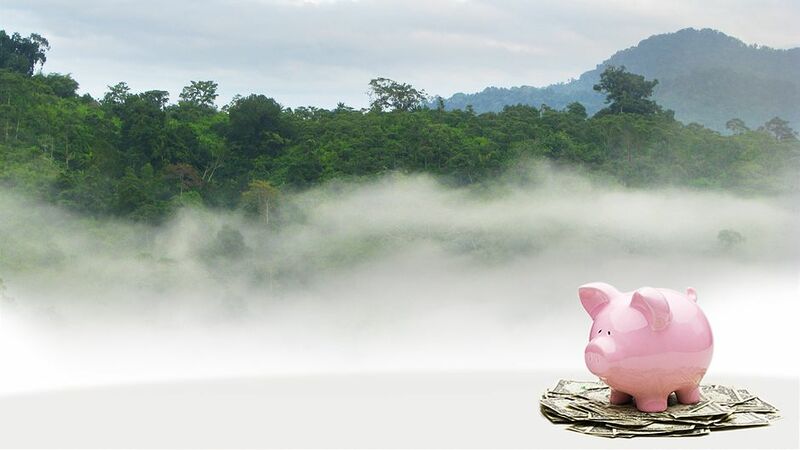 Why is it so easy to save the banks — but so hard to save the biosphere? They bailed out the banks in days. But even deciding to bail out the planet is taking decades. Nicholas Stern estimated that capping climate change would cost around 1% of global GDP, while sitting back and letting it hit us would cost between 5 and 20%. One per cent of GDP is, at the moment, $630 billion. By March 2009, Bloomberg has revealed, the US Federal Reserve had committed $7.77 trillion to the banks. That is just one government’s contribution: yet it amounts to 12 times the annual global climate change bill. Add the bailouts in other countries, and it rises several more times. This support was issued on demand: as soon as the banks said they wanted help, they got it. On just one day the Federal Reserve made $1.2tr available — more than the world has committed to tackling climate change in 20 years. Much of this was done both unconditionally and secretly: it took journalists two years to winkle out the detail. The banks shouted “help” and the government just opened its wallet. This all took place, remember, under George W. Bush, whose administration claimed to be fiscally conservative. But getting the US government to commit to any form of bailout for the planet — even a couple of billion — is like pulling teeth. “Unaffordable!” the Republicans (and many of the Democrats) shriek. It will wreck the economy! We’ll go back to living in caves! No legislator, as far as I know, has yet been able to explain why making $7.7 trillion available to the banks is affordable, while investing far smaller sums in new technologies and energy saving is not. That said, the outcome at Durban, after some superhuman feats of traction, was better than most environmentalists expected. After Copenhagen and Cancún, it seemed implausible that rich and poor nations would ever agree that they would one day strike a legally binding treaty, but they have. That doesn’t mean that the outcome was good: even if everything happens as planned, we are still likely to end up with more than 2°C of warming, which threatens great harm to many of the world’s people and places. • The first group failed in its attempt to get this done quickly. The poorest nations wanted a legally binding outcome by the end of next year. But the US-China group held out for 2020, and got it. Unless this changes, it makes limiting the global temperature rise to 2°C or less much harder — perhaps impossible. • The countries agreed to create a green climate fund to help developing nations limit their greenhouse gas emissions and adapt to the impacts of global warming. But, with three exceptions — South Korea, Germany and Denmark — they didn’t agree to put any money into it. The fund is supposed to receive $100 billion a year: a lot of money, until you compare it to what the banks got. • Between now and 2020, all we have to rely on are countries’ voluntary commitments. According to a UN study, these fall short of the cuts required to prevent more than 2°C of global warming — by some 6 billion tonnes of carbon dioxide. • But as the Durban agreement conceded, 2°C is still too high. It raised the possibility of pledging to keep the rise to no more than 1.5°C. This would require a much faster programme of cuts than it envisages. This article was published on guardian.co.uk on 16 December 2011. George Monbiot is the author of the bestselling books The Age of Consent: A Manifesto for a New World Order and Captive State: The Corporate Takeover of Britain, as well as the investigative travel books Poisoned Arrows, Amazon Watershed and No Man’s Land. It is time to press for carbon tariffs, in addition to carbon trading & carbon taxes. That is the only way to allow carbon prices to rise in those countries that have them, while protecting their energy-intensive industry to the extent that they don’t simply move to countries without carbon pricing. This is utterly reasonable. The WTO should allow it. And a standard formula could be devised to calculate it. If possible, the tariff should be on the embedded carbon. This should start with energy intensive products like steel, aluminium. I would say that you can not manage what you can not measure. I think that’s the fundamental problem for saving biosphere. We can not quantify the value of our ecosystem adequately. On the other hand, it is easier to see consequences of bankruptcy numerically and people can come up with solutions to respond to such quantifiable impacts. Uniform, acceptable and solid measures to quantify GHG are required to adequately respond to the crisis of biosphere, I think. Ecosystem is so large that we can not control it in every aspect. And unfortunately, humanity is real slow to act upon and many controversial discussions delay the real solutions for years.